nevard_120327_crew_po_DSC_3191, a photo by nevardmedia on Flickr. Ever so often a break from toy chuffers and a day out with good company is required. Model trains are great, but it can be a rather solitary hobby, so getting out and seeing the real thing in the wild outdoors with a little excercise and great company addresses that quite nicely. Due to work commitments, dates get planned some time in advance, so to get a day when it's not raining or simply very dull is more luck than anything else. Boys day out trips ( aka: 'BDO' or 'SAGAlouts outing') tend to get around most places within 2 or 3 hours from home, with Tuesday's jolly being to South Wales, the focus being to capture the first day of Arriva's new Class 67 loco-haulded Cardiff to Holyhead workings. Luck was on our side, and the good 'summer' weather we've enjoyed here in Blightly played game for once and allowed a cracking day out in full sun from first thing right through the day. Being in the company of 'those in the know' locations flip-flopped in a random manner between Portskerren, Severn Tunnel Junction, Duffryn and Ponthir, with locations optomised around freight workings and the Arriva Class 67's which meant visiting a couple of spots more than once. 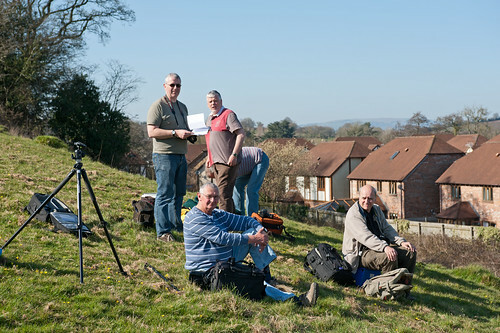 The above shot is 'the crew' waiting on the hiilside at Ponthir for the 67 hauled Cardiff to Holyhead service. nevard_110515_brewQ_IMG_9890_web, a photo by nevardmedia on Flickr. This is a 'reprint' from a deleted page posted last May..
Betty Blogsworth, who is sometimes known as a bit of the jobs worth at Her Majesty's Customs and Excise office at nearby Bristol Docks will shortly be marrying accountant and well known railway photographer Ivan Locksmith. Ivan as I'm sure you all know doesn't need any excuse to feature his pre-war Austin in his railway photographs, but now with his forthcoming marriage the car has to compete with Betty for exposure onto film. As well as a new lady in his life, Ivan was keen to try out his new 135mm f4 Elmar on his Leica loaded with a roll of Kodachrome 8.
nevard_100903_lower-bas_66078_DSC_9382_web, a photo by nevardmedia on Flickr. From time to time a few mates and I get together to photograph full sized trains. 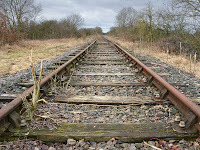 We call it 'railway photography', but to everybody else it's simply 'trainspotting', but with a camera of course. I hope to be doing a little of this in a couple of days as a break from snapping miniature chuffers, especially seeing that the outlook is great this coming week. After snapping a passing freight train it's usual to gaze at the camera review screen noting the 'all important' loco number. 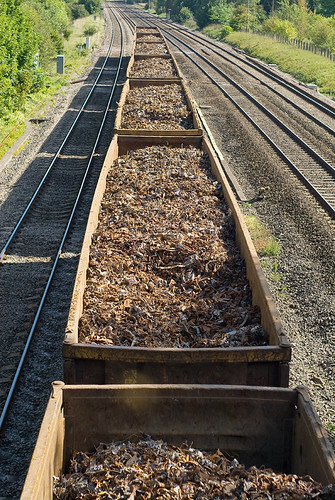 To me what the train is carrying is often far more interesting, with open wagons like the ones here showing off their load perfectly. This train is the Hitchin to Cardiff Tidal scrap captured passing Lower Basildon in the Thames valley a couple of years ago, and if one imagines it in OO gauge, it looks like a load of tobacco or even tea leaves. We tend to think of scrap is big lumps of bent rusty metal, but what we see here is a lot finer and not maybe what would be expected. Another thing modellers might find interesting is the way the wagons are bulging outwards, this is something rearly modelled, but could probably be achieved quite easily with something below the load to push the sides out. All this demonstrates just how important it is to look at photos of the real thing and not simply imagine what things look like, for it's all too easy to make a model-of-a-model, or a model-of-supposition which can be wrong - we all do it, I've done it loads of times. For example, how many people think that water is blue? It rarely is unless looking out at the open sea when the sky is clear and blue. Here is a bigger view of the above photo. 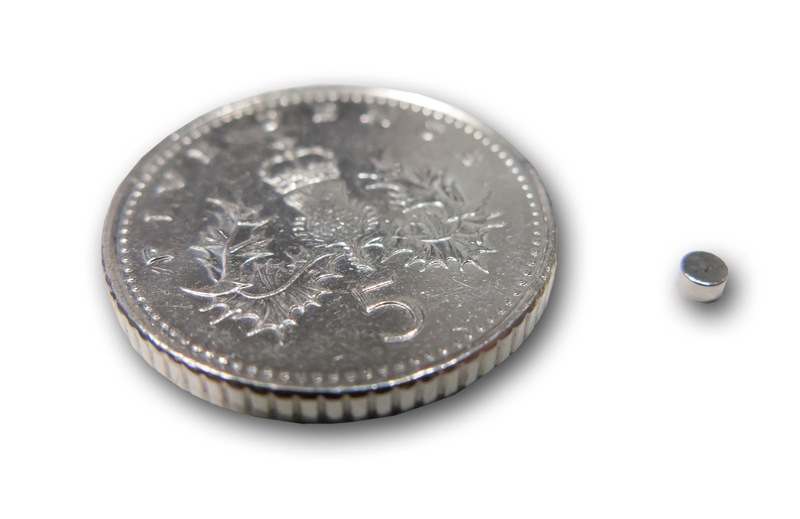 The Magnet Expert has released a series of British made tiny and not so tiny Neodymium magnets aimed at the model maker, the photo here displaying the smallest one which just 1mm square! 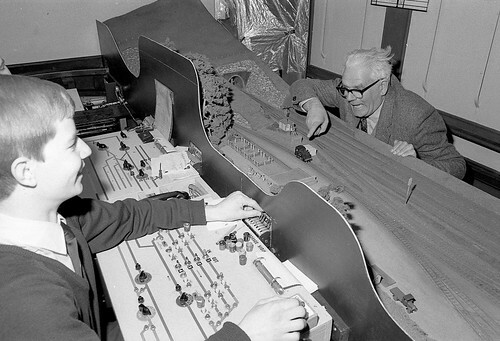 Railway modellers frequently use magnets for hands-free uncoupling systems, the miniature one here could see use for holding details in place like figures and cars on portable layouts if a little ferrous metal is embedded within or under the layout surface and the magnet attached to the model. Bigger magnets could see use for holding lightweight baseboards together because they are incredibly powerful, so powerful that they’re supplied with a health and safety handling information sheet! Play the vid below to see just how powerful Neodymium magnets are! 120322_bach-7_plk3_DSC_3019, a photo by nevardmedia on Flickr. 'Pug' No. 51202 trundles along the wharf at Brewhouse Quay with a rake of tatty private owner wagons. The ready to run wagons blending in well with the slightly rundown surroundings. The other day this Bachmann 37-095 'Coal Trader' 7 Plank Private Owner Wagons *triple pack set arrived. Until recently I'd never rated factory weathered ready to run rolling stock because the weathering has usually been just a mist of curry coloured paint along the lower surfaces rather than soot, grime, wear and tear. These are however different and look like the distressing has been stencilled on along with the obligatory misting of chicken bhuna coloured paint.The effect is rather like how ex-private owners wagons would have looked in early BR days, and all that's needed for the keen modeller to do is to apply BR numbering onto black panels to make them suitable for the 1950's along with some loads and a little extra weathering mostly on the insides which are far too pristine. 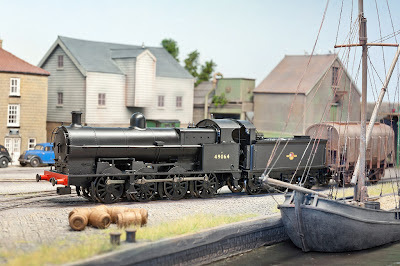 One could of course say that modellers these days re being de-skilled with such releases, which is of course true if one looks at things negatively, but my view is that those with limited modelling time can dedicate precious time to other aspects of the hobby or layout building. 5 years ago many said the same thing about ready to plonk resin buildings, but now these have been accepted even by the most conservative of fine scale modellers. And of course there's nothing stopping modellers from a little modification to personalise them. Click on the links below for close up shots of the individual wagons, note that the hook and bar couplings have been user changed to 3 links (Smiths). 8404_smrs_expo_019, a photo by nevardmedia on Flickr. Earlier today I decided to upload a few 35mm negative scans of toy chuffers taken between 1981 and 1984. Many of them were taken down the long gone Southampton Model Railway Society clubrooms at Sholing Railway Station which housed Newhampton, a huge OO gauge out and back and duck under Southampton Terminus inspired layout. I remember that the standard of modelling at the time was generally a cut above the norm, with the miniature portrayal of the real Southampton Terminus buildings being quite stunning. I believe this layout still exists in private ownership, but would love to know if it is still operational. Newhampton's legacy lives on with Romsey which is built to a similar standard, and only recently retired from the exhibition circuit. Another nice little SMRS layout featured is Overcombe, a ficticious OO gauge 'could have been' branchline terminus up in the hills above Weymouth, I recall it even had a ball clay working. This layout I gather still exists too, and I wonder if the ball clay transfer shed is still in one piece that I built all those years ago? In those days I used kitchen foil that had been textured with a ball point pen in close parallel lines to create the effect of corrugated iron. Most of the other photos were taken at various railway exhibitions in the south-east, with the pinnacle seeing Chiltern Green & Luton Hoo in N gauge & 2 mm scale by The Model Railway Club at the IMREX event at Wembley in 1984. This layout really was impressive, and it was the first time I ever saw handbuilt 9mm gauge finescale track which looked incredibly fine and delicate. I've no idea if this layout still exists, but I believe this showing at IMREX was its last. If anyone can add anything to the captions feel free, you can reply here, or if a Flickr member comment on the photograps directly. Some of the captions I admit are a bit of guesswork, and of course traditional film doesn't contain EXIF data like a digital photo for dating purposes! 120316_winsbeerfest_DSC_2698, a photo by nevardmedia on Flickr. Rather than write about toy chuffers, today's blog is about one of my other passions and the one which will probably take me to an early grave - BEER!! Last weekend was the Winslow Beer Festival, which now in its 6th year is very much one of the better small festivals that has sprung up in recent times. Ths Buckinghamshire festival is is a joint venture between the local CAMRA group and the Winslow Lions, and one of the the things that makes it different to many festivals is that all the beer is sponsored by local businesses meaning that all the beer and cider is is already paid for, thus allowing a greater sum of money to be donated to charity which can only be a good thing. 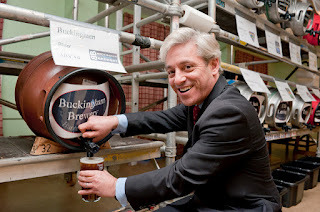 The beer festival is normally opened on the Friday night by a well-known personality, and this year MP John Bercow - Speaker of The House of Commons held the honour with an amusing speech reflecting on the day job "order order!" Having been to nearly all Winslow Beer Festivals, something I have noticed is the ever increasing number of local breweries springing up, and this annual event being an excellent showcase to promote themselves, with The Buckingham Brewery being a new kid on the block worth seeking out. And because you expect to read about trains; it's not been possible to get a train to Winslow since the late 1960's when the local station closed. I gather there is a bus service of sorts, but it's certainly no good for an evening jolly like this. So to get to it you need a driver, drink lemonade all evening, a tent in a field, a room at the local hotel (The Bell), or to sleep in a doorway which is really not an option for even the hardiest of beer lovers. Good news! 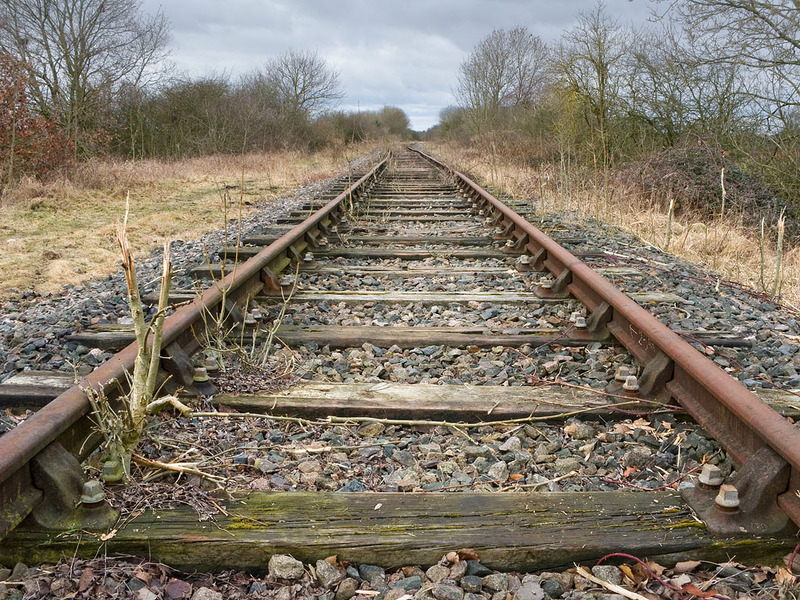 Within a few years, the Bletchley to Bicester line which is currently in a mothballed state should be reopening for passengers which will open up the festival for beer fanciers from further afield - good times! 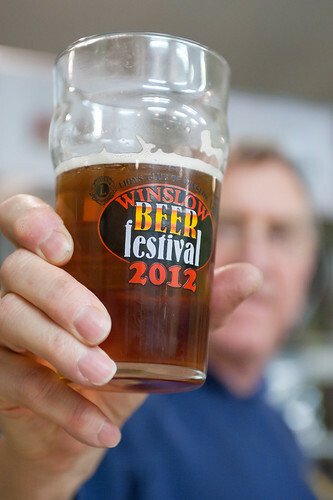 Offical Winslow Beer Festival Photos - quite a few in fact! 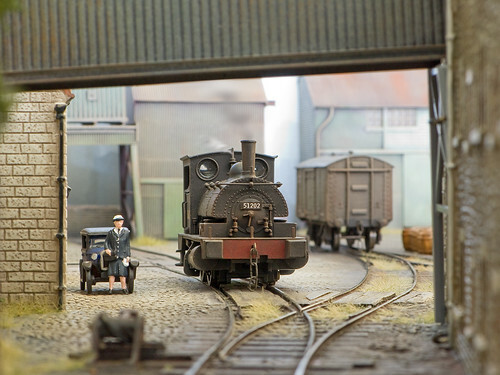 A rare glimpse of Pete's 'O' gauge diesel fleet in action on his 'Leamington Spa' layout, with photographs by Chris Nevard. First pictures of the Heljan AC Cars railbus and Class 128 parcels railcar, News, Q&A and much more! 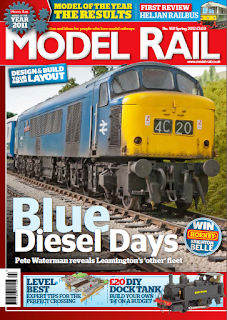 Model Rail is published every 4 weeks which means 13 issues a year, hence this issue is called 'Spring'. 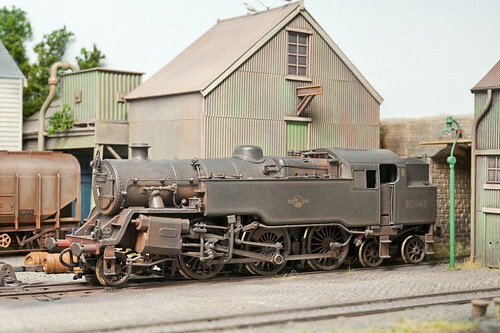 Just a quick post; here's the latest arrival for a customization in the form of renumbering, weathering and go on in the form of Bachmann's rather delicious 'Super D' 0-8-0 7F freight loco. I can see it having use on Brewhouse Quay and Cement Quay when in steam mode. 120312_polbrock_DSC_2368, a photo by nevardmedia on Flickr. Being serious for moment, which I do find that hard at times to be honest - you may notice that Polbrock is a little more complete than in previous photos with the addition of rickety fencing and more sun-burnt late-summer tall grass. 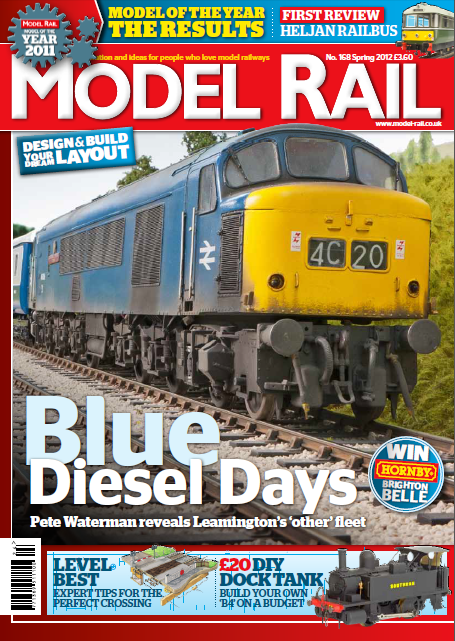 I needed to get a move on, because 'Part 1' on 'how it was dun' will be appearing in Model Rail very shortly. It will be a 4 part 'Workbench' feature covering the construction aspects in detail. In another feature I'll also touch on the home brew backscene seen here which anyone with a camera and computer can create, and you don't even need a printer or to mess about with wallpaper paste getting into a right wrinkly old mess. 4571 trundles past the Pedant & Armchair pub at Polbrock. As we all know by now, this pub was reputedly popular with nit-pickers, 'expert' armchair modellers and society misfits. You might not know that It was closed down shortly after this photo was taken and the customers mostly locked up in Bodmin Gaol or forced out into the real world to communicate with the general public in a civilized manner. The pub then burnt down mysteriously, the cause thought to have been a burning coal from a passing train. The loco crew didn't want to be associated with it, so cannot be seen in the shot. The owner of the abandoned car is hiding off scene to the left, not wanting to be stopped outside the pub for any length of time. Shortly after the photo was taken, its owner ran back to the car and headed off over the crossing without delay to avoid the most irritating adenoidals coming out of the pub with copies of the highway code telling the owner that he or she was at the wrong distance from the crossing and that the car tyre pressures where 4psi low and that the recent repaint was the wrong shade of midnight blue. Trainee nit-pickers will of course notice the BR orange curtains in the pub windows, we don't want to dwell too much on the activities that went on behind them, but the chances are it was something to do with trains entering tunnels and soiled pages ripped out of old Ian Allan ABC books - horrible! In recent years commercial paranormal groups have held vigils on the site of this pub to try to communicate with the horrors that frequented this place. Exorcism has so far failed to expel the dark spirit/spotters that allegedly haunt this spot. nevard_120312_signal_BQ_DSC_2419, a photo by nevardmedia on Flickr. I've had this loco since around 2004 when it first appeared much celebrated from the Bachmann stable. One of the first things I did was to renumber it as Templecombe's (71H) Standard 4 2-6-4 tank No. 80043 and give it a quick blast with the airbrush to tone it down. This loco is one of those great ones for an all weekender exhibition, it just runs on and on with no hassle and without the wheels treads building up with gunk even at the sweatiest and smelliest of toy chuffer shows. This is much like the real thing I imagine, back when steam was just hanging in there on Britain's worn out post-war railways. Last weekend, I pulled the loco out of its box and came to the conclusion that the weathering has fallen behind my more recent projects that have moved beyond a simple blast with a mucky matt varnish concoction. Luckily this engine, which saw out its days on the Somerset & Dorset Line and withdrawn on 7 March 1966 was well photographed, so there is plenty of material to use as reference along with other members of the same class. Something I did notice, and as a change from my other weathering jobs is the large amount of orange (rust?) which appeared around the front end and cylinders. The upper surfaces tended to get covered in quite a bit of ash, which I imagine looked worse if it hadn't rained for a bit. The rest of the loco would have that smeared oily 'Christmas Pudding' covering which can be easily replicated by dry-brushing on black metal-cote from Humbrol. A build-up of brake block dust from use on stopping services would tend to add a dusting of orange too along with corrosion. We often despair at the state grubby state of engines in their latter years, but I have a hunch that the congealed oily coating protected the metal work from further corrosion, this allowing scrapped engines, many of which breathed salty air at Barry Scrapyard to survive just long enough to be spotted for preservation and then stored for even longer, almost forgotten at the end of sidings on heritage railways. 8506_botley_33014_p_c-nevard, a photo by nevardmedia on Flickr. 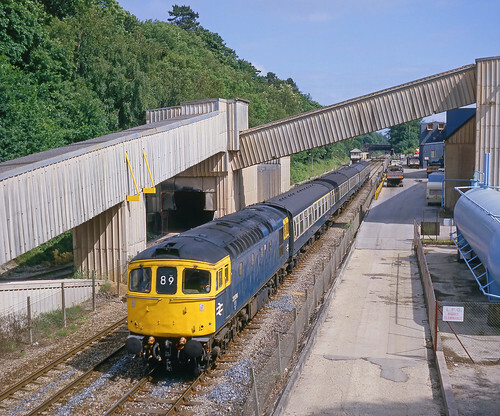 Due to the Southampton Tunnel blockade, 33014 powers a diverted Portsmouth Harbour to Bristol train through Botley on a glorious Summer's day in June 1985. Bigger version here. It's scary for me this think that this photo was taken over 25 years ago, because it does feel just like last summer. Looking ahead 25 years from now, and if I'm still alive I'll probably be in a bath chair or be one of those doddery rude old gits seen at railway shows that crash into you and push past your well behaved children. Failing that, I'll be that very slow driver in front of you and the 25 other cars on that windy route that you stand no chance of being able to overtake me on. Then later in the evening, my eyesight will be so bad I'll try to eat the floral pattern off the dinner plate, and I'll be always grumbling about the youth of today - actually I do that already! The youth bit, not the dinners plate. Yet. I remember the day well, it was a comfortable 25 celcius or so, and I'd cycled the 8 or so miles from my parent's house in Hamble. At the time I was a photography student at Salisbury College of Art, and it was around the end of term so I'd probably gone home for the weekend. In those pre-internet days I'm not sure how I knew that the trains were being diverted away the more usual Netley route because of engineering work on the tunnel at Southampton, but there were a few railwaymen at the Southampton Model Railway Society I belonged to at the time who may have given me the nod. More likely though it was simply because I travelled by train quite a bit had seen the notices! It does make me think just how much we rely on the web these days for almost everything! One thing that sticks on my mind from that sunny day, was the petrol station next to Botley railway station where I bought a cheese filled roll and a can of fizzy pop. When I chomped into it, the flavour was a bit like compost (not that I eat compost rgularly) and upon further investigation found the roll full of mould! I couldn't be bothered to go back to the garage, but I do recall the chap at the till saying that the fridge was up the spout. These days I'd not take such a risk and would certainly not put up with rotten food by taking it straight back. The camera I used much time was a late 1950's Rolleicord Va, a trusty German built camera that shoots 12 x 6x6cm exposures on a roll of 120 film. The lens had a maximum aperture of only f3.5, so to be able to shoot at the 1/500 sec shutter speed to stop and fast moving train you needed sunlight for the 100 iso Fujichrome the above photo was taken on - this shot probably being 1/500 at f5.6. On overcast days whilst I could have chosen a fast transparency which generally was indifferent in quality and very grainy, so we tended to shoot black and white. For younger readers, black and white must seem odd, but in those days B&W was the norm for publication and home processing. Nearly all magazines and books apart from the posher ones and National Geographic were mostly B&W apart from the cover and maybe a centre spread. The cameras and trains may have changed, and I'm certainly no longer that mug who bought rotten filled rolls, but interestingly enough this location looks quite similar which is still a stone off loading terminal for trains from the Mendips. Even the signalbox is still there, albeit semi-derelict and looking like it's not been painted since this photo was taken. nevard_111101_snow_DSC_4427_WEB, a photo by nevardmedia on Flickr. After some of the warmest late winter days recently with temperatures hitting the upper teens, some parts of this wet island we live on have since had more snow just we thought that winter was all but over for this side of 2012. This strange weather is probably the bi-product of some grubby far east factory producing cheap highly detailed model locos and trains. That’s another story though, well for another day anyway. I was going to keep this shot for much later in the year, but for want of something to write about which isn’t about toy train forum and magazine buy-outs, those are being discussed to death on forums by people who think the world has ended. So, concentrating on the hobby rather that toy chuff chuff politics, let’s talk about toy snow. Some of you may have seen this photo in the January 2012 Model Rail mag where it was used to illustrate various products to recreate the effect of snow. I tried a few of them out, but found the one which stuck to everything like snow in a blizzard wasn't a model snow product at all, but decorator's plaster applied with the kitchen sieve! Whilst it looks great in a model photo like this, I'd not recommend it for anything other than photography because it gets everywhere. In the end I had to take the locos and diorama outside to blast the stuff off. The rear loco has a very flat finish, and despite a good dusting off after the studio session, it still has the white powder engrained into the paint. Still, it gives a good effect to an engine which spends much of its time shunting at a miniature cement works! If I’d used plaster on a working railway the powder would almost certainly mess up the delicate works. For a working model railway it is better to stick to the bespoke model snow products because they won't damage your trains. The rather good snow plough is the recent release from Flangeway, and with that nice sharp front end could almost certainly be used on a large model railway to remove pets and children’s toys which may have somehow ended up where they shouldn’t have. nevard_120301_signal_BQ_DSC_1989, a photo by nevardmedia on Flickr. Going through some old railway bits the other day I came across a couple of these semaphores. They are mostly metal but set into a bakelite base which houses what appears to be an electro-magnet for operation. At the top of the signal is a small bulb which sits behind the coloured optics. I have a hunch these are of Americal origin because the signal arm is the other way around to what we'd expect in the UK. If any readers know add your thoughts below. In its current form it's rather toy like with the heavy base, but could find some use on an industrial location like with Brewhouse Quay if the post was set into the ground so the black base is below baseboard height. Even set into the base board the signal arm is high enough to clear any rolling stock, and because industrial locations often used non-standard gear the signal arm being the reverse of the norm could be feasable. 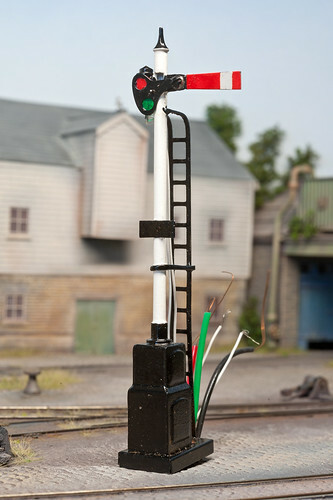 This signal could work on Brewhouse Quay just where the line exits the layout, why a signal? Well of course there is a passing loop or busy road just off-set of course! Or simply for the fiddle yard operator to indicate that the fiddle yard is ready.